Every now and then, a story comes forward from within the museum’s collection that astounds us. For a long time the identity of the young woman depicted in this World War II propaganda poster was a mystery. Staggeringly, just two months ago, the woman on the poster came forward. This is a snippet from Weslee D’Audney’s story which has featured in the museum’s latest issue of Signals. The exhibition Persuasion: US propaganda posters from WWII closes on 20 March 2014. “I HAVE NEVER BEEN FAMOUS, though my face adorns a famous poster that blanketed America during World War II – and even now pops up almost weekly in a new form. I’m probably the only person alive who remembers its creation. 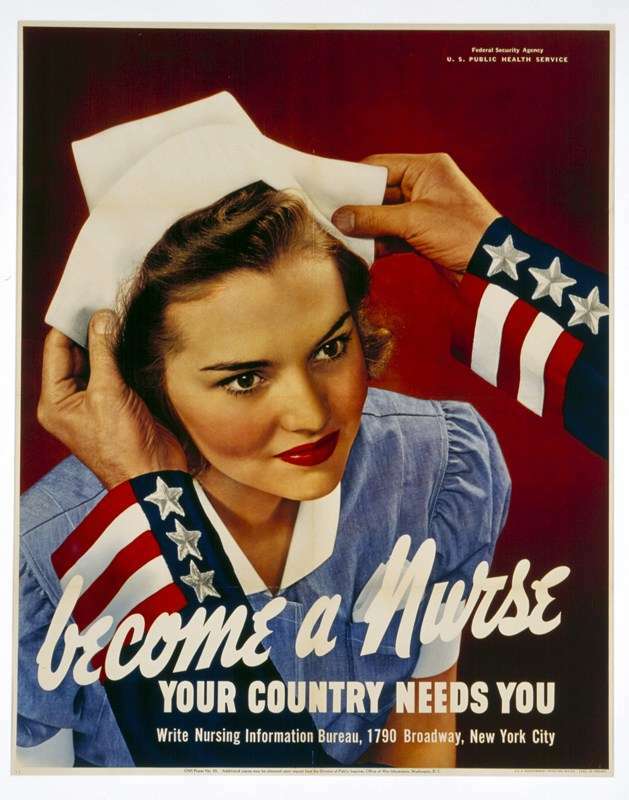 Following the attack on Pearl Harbor on 7 December 1941, President Franklin Roosevelt and his cabinet foresaw a long war with heavy casualties, and made the recruitment and training of new nurses a high priority. In July 1942, I was 17 years old and a first-year pre-med student at Barnard College, Columbia University, in New York City. 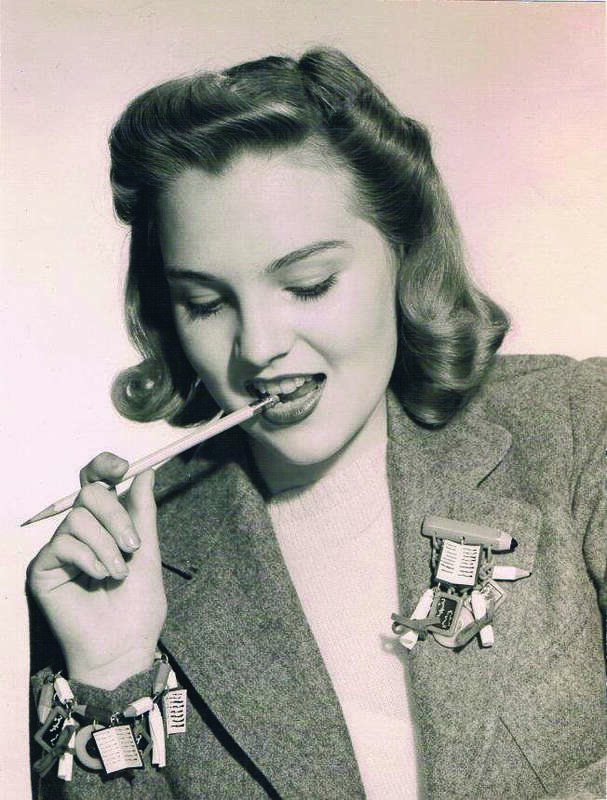 I earned my college expenses doing back-to-school fashion shows for Fifth Avenue stores and posing for story illustrations in Saturday Evening Post and for various magazine advertisements. I was in demand as the ‘wholesome outdoor type’ and was called the ‘clean face of young America’. William Ritter, a well-known commercial photographer for whom I had worked previously, called me for an appointment. When I arrived at his studio I was asked to put on a student nurse’s uniform. An older man was given two navy-blue sleeves with white stars and red-and-white stripes to slip on. They had obviously been specially made for this shoot. The reproduction posters are available in poster shops and bookstores throughout the United States and via the internet. They come in various sizes, framed, unframed, single or double matted, printed on archival paper, on canvas or as a mural. Dozens of internet sites offer items decorated with the poster: on all sorts of t-shirts (even for dogs), sweatshirts, hoodies, tracksuits and baseball jerseys; also on boxer shorts, trucker hats, baseball caps, baby bibs, infant creepers, teddy bears, barbecue aprons, sofa cushions, backpacks, tote bags, school bags, mugs, steins, postcards, greeting cards, journals, diaries, calendars, wall clocks, stickers, tiles, coasters, keepsake boxes, badges, ceramic wall decorations, brooches, medallions, bumper stickers, skateboards, silk ties and refrigerator magnets. The museum wishes to thank Weslee D’Audney for permission to reproduce this article, and Carol D’Audney for her assistance. Blog introduction by Nicole Cama. For the full article by Weslee D’Audney, pick up the latest issue of the museum’s Signals magazine.